In contrast to the opulence of both the French Lick Springs Hotel and the West Baden Springs Hotel is the more modest, mid-sized Homestead Hotel. This building, located across the street from the West Baden Springs Hotel, was built in 1913. Smaller hotels began appearing in the Springs Valley in the late 1890s. The rates at both French Lick and West Baden ranged from $2-$3 a day so only the wealthy could afford to stay there. The mineral waters and casinos were a powerful enough draw that people of all classes wanted to visit the valley. This resulted in the construction of a series of mid-sized hotels that only charged $1 per day including meals. The Homestead is the only mid-sized hotel that remains today. The Homestead Hotel is a brick, three story tall structure. 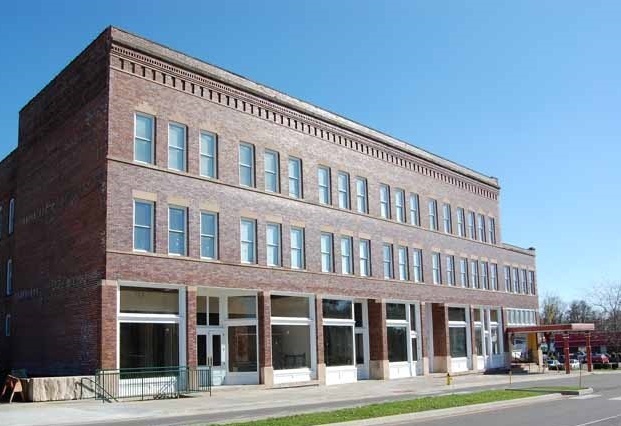 The first floor was used for commercial space while the upper floors offered guest rooms. The retail space included a saloon, drugstore, dry goods store, restaurant, town post office, and a ladies’ clothing store. There were no casinos or mineral baths at the Homestead. However, these amenities were available at other hotels in the valley. By 1913, three of the 21 hotels had established public casinos. Hotel guests at the Homestead were able to purchase a “water privilege ticket” for either French Lick or West Baden to “take the waters”. Indiana Division of Historic Preservation and Archaeology, “Homestead Hotel,” Discover Indiana, accessed April 25, 2019, https://publichistory.iupui.edu/items/show/312. Published on Feb 5, 2018. Last updated on Apr 2, 2019.